Creating and crafting are something that happens often, if not daily, in our home. We all enjoy different forms of crafting and so when Zirrly came up to review their Super Beads, we were more than happy to try out the Super Beads Bird Set. Since it arrived just as Miss J was finishing up her unit study about birds, this made a nice final project. Zirrly is a company that creates various crafting items and kits. Whether you are looking for bead crafts like these, wood crafts, ceramics, fabric projects, or dough/clay, there are lots of options. They also have a selection of materials to purchase. This is a great crafting site to go to when you need something. We received the Super Beads Bird Set. This kit arrived in a box, with all the materials tucked inside in a plastic divided holder. Each color of beads was individually packaged and it included two pegboards for making the creations. We also received three patterns, a spray bottle for the water, a tool for removing errant beads or pulling the creations off the pegboard, and instructions. We were warned ahead of time that the included instructions were not quite right and how to adapt them to work better. Miss J jumped right in, wanting to create her birds right away. We talked about what to do, but it wasn’t really needed since she has used a different brand of water-fusing beads before. She placed the pattern beneath the plastic tray and started adding her beads. After just a short while, she noticed that some of the beads had lines at one end and went into the tray best when those were all lined up at the top. Sure enough, that was in the instructions that I just thought I had read. She got her beads into the pattern and then we took it to the sink to spray. She sprayed it lightly as the instructions implied, tilted it to drain any extra off (there was none), and set it to dry over a paper towel since there were drain holes in the boards. After a couple of hours (the instructions said 1 hour), we checked to see if it was dry. It was but when we pried it off the board, it came apart. So, we put them back in the right place and resprayed it. This time we REALLY sprayed it so that there was water that drained off. And we left it to dry overnight (partly for the time and partly because it was time for bed). When we took it off the board in the morning, the side that had been against the board was sticky and wet. So, we just took it off the pegboard, turned everything over and let it dry again. We did not re-secure it to the pegboard but should have because it warped a bit as it dried. Once we knew the process, Miss J was happy to create her other two birds from the kit. She did them both at once. She put them together following the pattern, sprayed them well, drained them, let them dry several hours, turned them over, let them dry some more. Finally, she took them off the pegboard for the final time and put them together. Their little stands were cute and worked well. These were a fun activity and the kit came with several extra beads. Not enough to remake any of the bird patterns but enough that a child could create their own project or pattern with what was there. We did end up with a number of broken beads in our kit and if we had had any additional ones broken in one of the colors, we would have had to adapt the pattern because we did not end up with any extras after making all three birds. The water-fusing beads do well and Zirrly’s are sturdy after they are dry. Other brands we have used are round and come apart much more easily than theses. The Zirrly creations are also a bit flexible when dry, part of what makes them less prone to breaking apart. This is certainly a company we would be happy to use a kit from again. It was fun. It was okay. I kind of like Zirrly beads but I kind of thought that for as long as it took to dry the first time, it was crazy for it to fall apart. I really liked the parrot; it was very colorful. I would recommend a bag full of mixed colors rather than the kit because the kit only makes a few things and we couldn’t be very creative. I would recommend these for about age 6 and up. Click below to read about the different products. The Á La Carte projects are small chunks of a study – a game, a timeline, a short lapbook, a project. These small chunks of learning are great for when you are looking for an extension of a study you are doing or wanting a hands-on project of some sort. They cover some really good information but are not long, extensive studies. The Á La Carte projects are often included in a larger, more in-depth study if you are looking for more. Home School in the Woods is a company that creates digital, downloadable projects and studies dealing with history – from ancient history to present day. Each project is well researched and you can feel confident that the information given is accurate. The projects are all downloaded to your computer so you can print at home and get started right away. The instructions for each project are included in the files and are very understandable. Miss J has been studying World War II and we were just finishing up the unit study we were on when this timeline from Home School In The Woods arrived. It is fantastic! 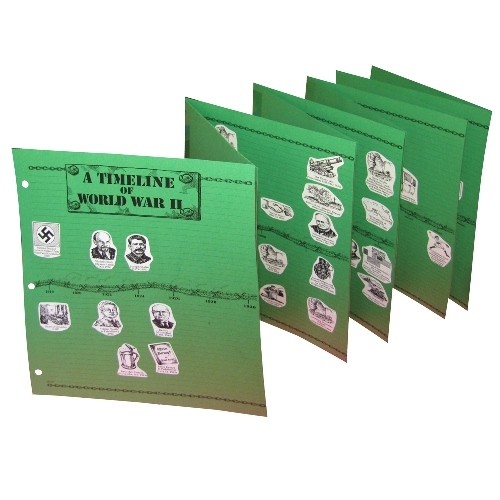 A Timeline of World War II is a downloadable product, purchased directly from HSITW. Once you download it, you can print it directly from your home. We chose to print it on colored printer paper, using blue for the timeline and neon green for the pieces we were glueing on. To get started, I followed the printing directions and then the cutting and taping directions to get the long timeline put together. We taped all the pieces of the timeline together and the it folds compactly for storage. It goes neatly into the notebooking notebook that each girl keeps. So Miss J has a wonderful timeline to add to her notebook now. Each day, we would pull out the timeline and look at the dates. We started back in WWI and looked at people and events that impacted the start of the war. It really did start back at the end of WWI, as the policies put in place then impacted various countries and caused hardship and discontent. Miss J would give the date and then read the placement on the timeline. She then got the pages of the pieces to cut out and glue on, searching for the right piece. She cut it out and glued it on. Then we would do an online search to find a short article or video on that event, place, or person. We would watch it or read about it. After that, we moved on to the next spot on the timeline. We would do six or eight items per day. It was a manageable amount for a 9 year old. This was a wonderful resource to learn a lot about WWII. In doing the timeline this way, combined with the research, Miss J had a very thorough grounding of the causes, actions, events, and people that influenced the war around the globe. I learned a ton, as well. There were a number of people I knew of but didn’t know their exact contributions to the war. I highly recommend studying history this way. It was a manageable chunk of history, yet it was very in-depth. It is lots of fun. I got through it kind of fast. It was kind of fun to learn about the people (like Hitler and Anne Frank). And it is fun to learn about people I didn’t know and didn’t know were there (like Joseph Stalin who was a very bad man). Now that we have finished the timeline, I am considering purchasing one I just noticed: WWII: On the Home Front Lap Book/Notebook Project. It is right up Miss J’s alley and continues on with the time period we have focused on for the past little bit. 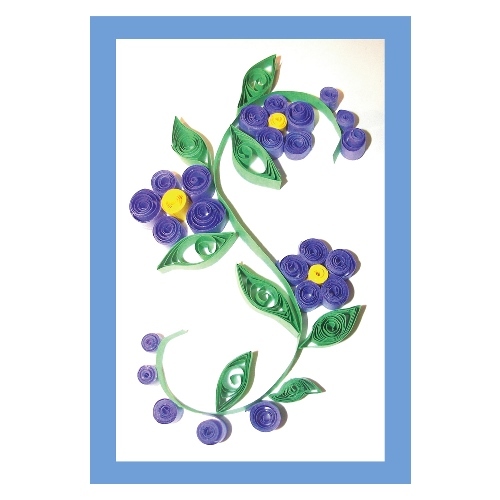 We also chose The Art of Quilling project to try out. Quilling is using paper strips, curling them, and then gluing them into a pattern. I have always wanted to try quilling because I remember a beautiful quilled piece that hung on the wall of my home growing up. We read a bit about quilling from the file and I talked about remembering the hanging growing up. We took the time right then to call my mom and ask her about it. She talked with Miss J about it, remembering creating it, and finishing it the way she did. She told Miss J about the process and what she remembered. It was a neat family connection that brought this project to life. You have to have a liquid glue that comes out well. Curling tighter is not necessarily better. Curling, adjusting, and shaping is all something that has to be worked on and manipulated for each place on the pattern. Age 9 was good for trying this out, with a simple pattern. If it were much more complicated or detailed, it might be a bit trying for Miss J. I would love it, though. We plan to try out more patterns if we can find some online. We chose the quilling project because it fits with the time period and activities of some of our reading and history lessons. From the 1800s – 1970s, quilling was fairly popular in various places. Since we were working on WWII and had just finished a book about pioneer times, it fit well. And it was fun to try something that people would have done during those times, as well as something that grandma had tried. That was awesome! It was fun. It took a long time, forever! But it was fun. It took two days; my final project was pretty. The Penny Rug Notebook/3D Project looks like another project that would be fun to tackle while sticking to the theme of WWII and thriftiness or using what you have. Home School in the Woods has wonderful Á La Carte products and these Á La Carte projects are often part of a large study, if you are looking for more. We have used Project Passport: Ancient Greece, Project Passport: Ancient Egypt, a la carte Erie Canal, Make-A-State, and more. Other Homeschool Review Crew families were trying out various other Home School in the Woods Á La Carte projects. Definitely go see them. These are an easy way to find a project that fits right in with a subject you may be studying without committing to a full year curriculum or a long-term study project. Click the banner to see more products reviewed by the Homeschool Review Crew. Find Home School in the Woods on social media. For a gift, one of the giggly girls got her sister this fashion design set based on the recent live-action Beauty and the Beast. It has been a terrifically fantastic hit. It is getting used for hours on end and all the giggly girls are sitting around together, listening to music,and designing outfits. I thought I would show you some of the outfits they have each designed, with more to come, I’m sure. Miss L is working on a series that are all related and since they aren’t all done, she wasn’t ready to share them with you. Maybe soon. Something to look forward to, right? With hours invested, I am thrilled that a purchase I was hesitant about has provided hour after hour of quality time together as sisters. This has been a fantastic gift that all of them have benefited from. 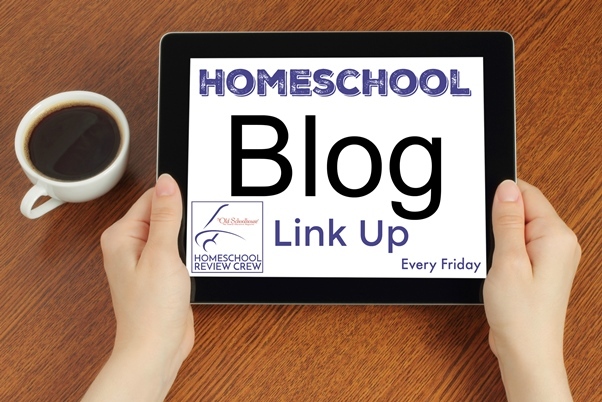 Linking up with the Homeschool Review Crew. Regardless of what is in the air or on the ground, this week’s lesson from Mystery Doug was on snow. It was a neat video talking about why snow appears white. Who knew? Well, I guess some people did but we didn’t until the video. Anyhow, we made snowflakes illustrating that idea. Wax paper and glue. Easy-peasy. Well, our snowflakes did not do as well as the ones on the videos but the idea was learned. And they did look neat as long as we didn’t pick them up. Miss J really liked the wax paper after the snowflakes came off of it. The impressions left were very pretty, too. Mystery Doug presented another really neat one. To kick off our school year, our church group got together for lunch and an activity. One of the ladies suggested doing some string wrapping. We had some string at the church building that was part of a stash of yarn and string belonging to a sweet, kind lady that is affectionately referred to as Mama D. Mama D has gone to her heavenly reward and is much missed here but has left behind an amazing legacy of love and gifts. We used some of her string for the students to create an initial of their own, giving each of them yet another special something from Mama D.
We used leftover plywood that we spray painted and cut a piece of paper the size of the wood block. Then we used a pencil to draw a block letter that would fit the wood. The students had the choice of a simple outline or a crossing pattern. For the simple outline, we just put nails in at each place where the string needed held in a particular shape. If they chose the crossing pattern we put nails every inch or so. We were not really particular and let most of the students pound their own nails in. After the nails were in, we tied the string to a nail and let them go at it. The outlines were good for the younger group and the older group really enjoyed doing the crisscrossing. They all came out lovely and they were really quite simple to do. Such a fun project to start our homeschooling year off. Crafting seems to be a constant around here and the idea of having some new ideas and products to work with is always exciting. When we heard about ACTÍVA Products and their Rigid Wrap and CelluClay Quik-Sculpting Kit, we were excited. Miss L loves to create all sorts of things and these materials would be just right. And to make it even more exciting, Activa is offering everyone a copy of their free ebook ACTÍVA Products’ Favorite Sculpture KIDS CRAFTS, which has full-color pictures and directions for creating a number of projects with the kit. ACTÍVA Products is a company that specializes in crafting materials. They offer paper mache products as well as other several other clay products, colored sand, casting materials, and even a few flower arranging materials. Their site also offers a huge number of ideas and instructions for creating projects with their offered materials. I got a lot of inspiration and have lots of ideas that I want to create. We received the Rigid Wrap and CelluClay Quik-Sculpting Kit for this review. When they arrived, there was a lot of excitement and we immediately pulled out the packages to look things over. In the box, were unlabeled packages and a photocopied instruction sheet. I’ll admit – these kind of dampened the excitement because I had to tell the kids that I had no clue what any of it was or how to use it. Labels would have been good and instructions on each product of how to use it would have been good. We did finally jump into projects but it was a bit intimidating. It was also very messy. I was very glad I had covered the table with a plastic cloth. And the kitchen floor had needed mopped anyway. These products create a lot of dust and very fine particles. Miss L chose to use the Rigid Wrap and created an angel and a rose. Sculpting those from the Rigid Wrap took some patience. To create the angel, she had to build up the biggest part and add the details slowly, allowing a bit of drying time in between. The wings took some finesse but she just patiently molded and shaped until they were as desired. Then she held them in place and I fanned until they would hold their shape. After she got it how she wanted it, she set it aside to air dry. This took about 5 days to fully dry and it dried to a matte finish white. She has a collection of angels that she loves that are minimally colored and for now, she will leave this one white, as it fits fairly well into the collection. For the rose, she cut each individual petal and one strip about 6 inches long. Dipping the long one into warm water, she then rolled it up for the center of the rose. Dipping each petal into the water, she would add it to the center, adjusting each petal to the shape and placement she wanted. She would then hold it in place while I fanned it to help it set and dry a bit. With so many pieces all on top of each other, it has taken a long time to dry. She had to leave for camp before it was dry so it will be painted when she returns. I wasn’t as brave but I did want to try the product myself so I took on the star and snowman ornament from the ebook. Using a cardboard star cut from a box, I cut strips of Rigid Wrap and placed them over the star. Using my fingers to smooth it out and down over the edge, I covered the cardboard. After letting it dry for a bit, I took some of the scraps we had from other projects and used them to scrunch and fashion a snowman. I got the strips a bit wetter so they would stick better to the flat form. I was able to create some definition and depth by twisting and scrunching up the strips as I placed them. After it was fully dry, I painted it. While the yellow paint was wet, I shook some gold glitter down over it to add some sparkle. I hot glued the ribbon onto the back. I kind of like this little snowman. He brought some cool to the hot summer! The CelluClay, a recycled paper product for instant paper mache, I was a bit leery of. I didn’t feel like I had good instructions. But knowing I needed to at least try it out, I dove in. This product feels like the lint from a dryer. It is just as dusty, too. Please take precaution; inhaling this is awful, causing a lot of coughing. I guessed at how much I would need to make three ice cream shaped pieces from a candy mold I have. I put it into a plastic ziplocking bag and added a bit of water. I added just a bit of water at a time, zipping it closed, and then mashing it around through the plastic to mix it up. Once I felt like it was well mixed, I tried to use it. It was like pulling soggy paper apart and I had to add additional water. I was finally able to get it to a consistency I could use. I packed it into the mold until it was level on the back and I felt I would get good definition on the front detailing. I then removed it from the mold and added a red bead to be the cherry and to put a cord through. Then, I let it dry. It took about three times as long as I expected for it to dry. I even tried to speed it up, as they recommended, by using a hair dryer. I did that for about 15 minutes and felt like it did not really make much difference. So I left it to dry overnight at that point. When they were dry, I painted them and added the string. I can see several possibilities for CelluClay now that I have used it. I would love to see the company add good instructions to the kit’s box, either printed on the box or a sheet inside that addresses both products and is easier to read. The project ideas are fantastic and I would love to see more product ideas for CelluClay come with the kit, as well. ACTÍVA Products has some interesting products and ideas. 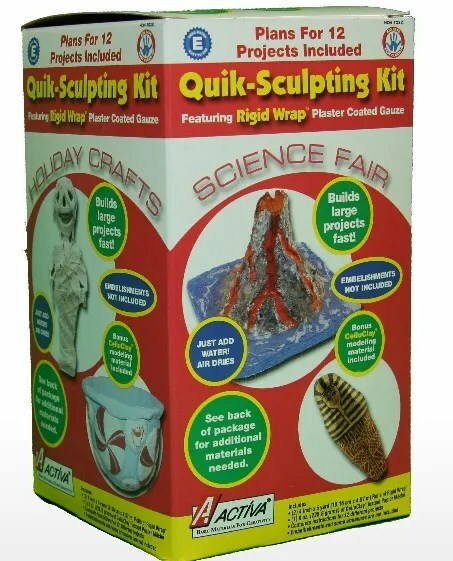 The Rigid Wrap and CelluClay Quik-Sculpting Kit is a great way to introduce your kids to the opportunities that abound with these products. Others have been creating some amazing projects with this kit, as well. 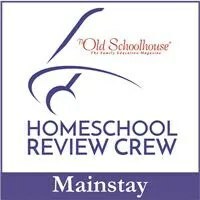 Head over to the Homeschool Review Crew blog by clicking on the banner below to find other projects.